Finding a discount while you are searching for a new product to buy is always a plus when it comes to deciding if you will buy it or not. Getting a certain percentage off of a product makes it more appealing and seem more worthwhile to buy it. This is especially true when it comes to apps for you PC or Mac device. Each day, developers put their apps online for sale with different software websites, app bundles, or even online at the App Store. The App Store, however, won’t list any discounts or link you to sites where you can get discounts. With how difficult it can be to easily access deals on apps online, this article is going to show some of the greatest sites for you to search for deals on apps. It is a website for software downloads. It updates daily with a list of the latest app updates for macOS. It includes apps that are free and ones you need to pay for. This site is open to use without signing up on the site even though you do receive good advantages if you do signup. This website offers wish-lists, email notifications, rating system, as well on deals on apps with MacUpdate Promo when you do sign up. When you go on the site, you will see an image slider near the top of the page featuring trendy apps, bundles of apps, and the apps that are currently trending. The sidebar has a section labeled “On promo right now…” that lists all of the apps currently running on a deal. The MacUpdate Promo provides different Mac apps at exclusive discounts, but only for a very limited time and only 6 days a week. If you do decide to go ahead and purchase the app with the MacUpdate Promo, it will track license keys and let you know when new updates are released. There are a few times each year where they also offer app bundles with a 50%-90% sale on them. StackSocial features a very wide variety of gadgets, electronic gears, design resources, and online courses, which are arranged into different categories. There are also a range of discounts, going anyway from 10% to 30%, sometimes more, depending on what is being sold. Going on the website, you can see what products are currently on sale by selecting “Categories” and then “Software.” The deals are arranged in a few ways: Best Sellers, Newest Sales, Bundles, Pay What You Want and the deals that expire soon. Only a few times each year, they will also feature great bundles of Mac apps. The best feature for many on StackSocial is the “Name Your Own Price” category. This category features apps that are offered for any value. The catch is that, in order to unlock all the apps, you need to pay a price higher than the average price. For example, say the average price for the bundle is $10. You would need to pay $11 to crack all of the apps offered in the bundle. A portion of the money paid also goes to different causes. Buying a bundle here lets you pick a charity from a list of charities they will donate money to. 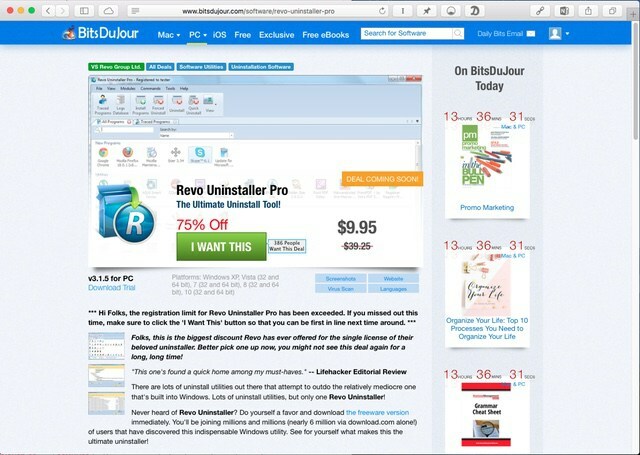 It is a website that offers all-in-one offer in order to give you exclusive discounts on PC and Mac apps. The website uses a coupon code system, which you need to copy and later paste when you are buying it from the developer’s website. Promotions usually last for a full 24 hours, with some occasionally going on for 48 hours. BitsDuJour is a very intuitive site to use and also lists every feature of the app online, including the description, screenshots, and if it includes support of other languages in it. Although these are great features, the top feature of the website is how involved the community is. You can always ask the developer if you have any doubts and you can put in your vote for apps you want a discount on among other things. Although they may end up featuring a deal that isn’t helpful to you all the time, you still have a good chance of finding some popular apps for a reduced price on this website. This particular website does its best to assist you find some fantastic Mac Store apps at more extreme discounts. As you may have gathered from the name, each Tuesday they offer several apps for either 2 dollars or at a reduced price. It is a fantastic site to go on if you want daily deals for various design resources, online courses or Mac apps. The bundles on this site consist of many apps where you select a few at a time for a particular fixed price. This site isn’t the best to go on if you want to find a lot of useful apps or have a wide and good selection of apps, but it is a great place to get some decent apps for a reduced rate. If you do choose to purchase the bundle on BundleHunt, the bundle will keep track of the license keys. These can be exported as .csv files and imported into 1Password to make sure you do not lose them. This website is ideal for anyone looking for academic software deals. 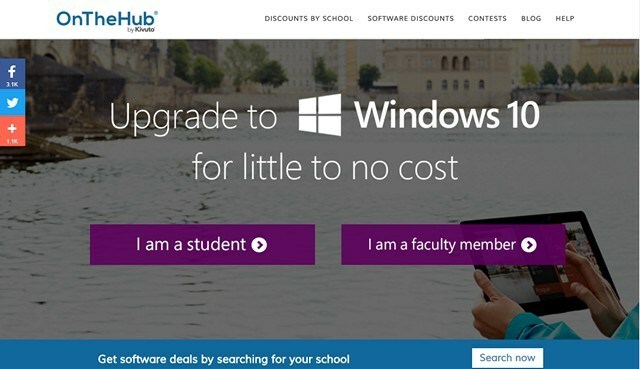 OnTheHub gives students and faculty members a chance to get discounted or free academic software they need for their courses. You will need to provide proof of affiliation with an academic institution or group before you get to order anything, however. By using this website, you can save some bucks or even get some for free. This includes software like Microsoft Windows 10, Parallels for Mac, Adobe Creative Cloud, EndNot, and many more. So, this particular website isn’t an ordinary deals site. This will recommend a batch of very well-curated and popular Mac or iOS apps that are on sale. The staff at MacStories handpicks the apps that go on sale. The deals available on this site cover every app category you can think of, from Music to Lifestyle to Games. 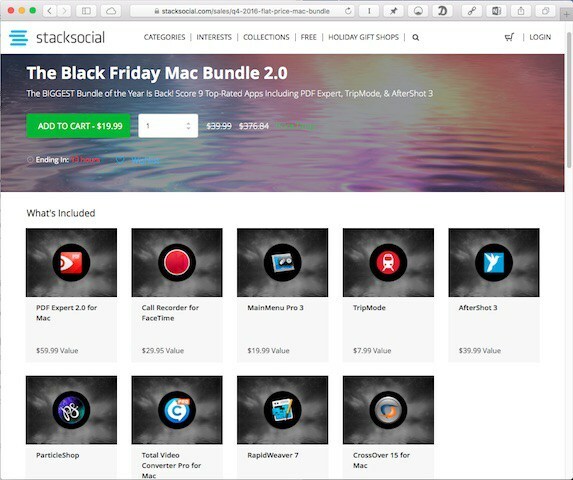 Each year for Black Friday and Cyber Monday, lots of Mac & iOS apps go on great deal. 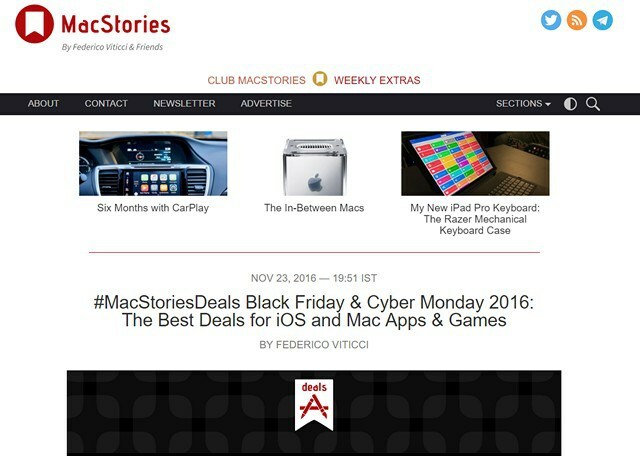 The MacStories group will collect the greatest deals and have them listed and linked in a page with where you can buy them. 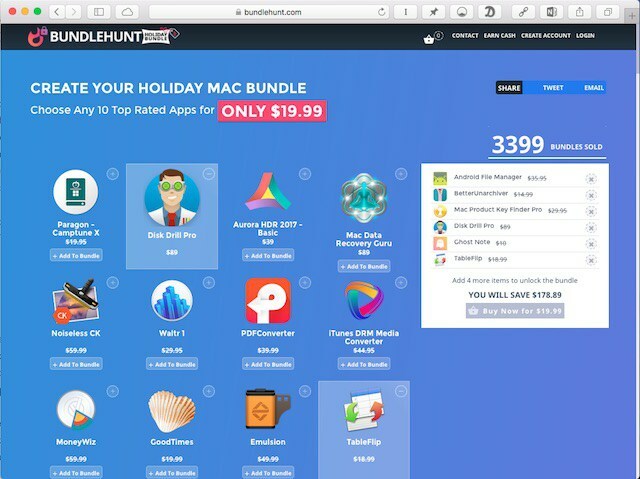 This website provides all kinds of deals for some great Mac apps, including BundleHunt, MacUpdate Promo and the list will go on. 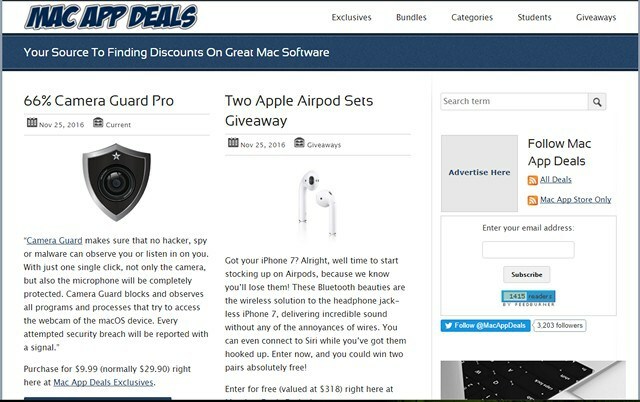 If you get more easily overwhelmed handling or looking through so many deals sites, following MacAppDeals is the best way to handle all of it. 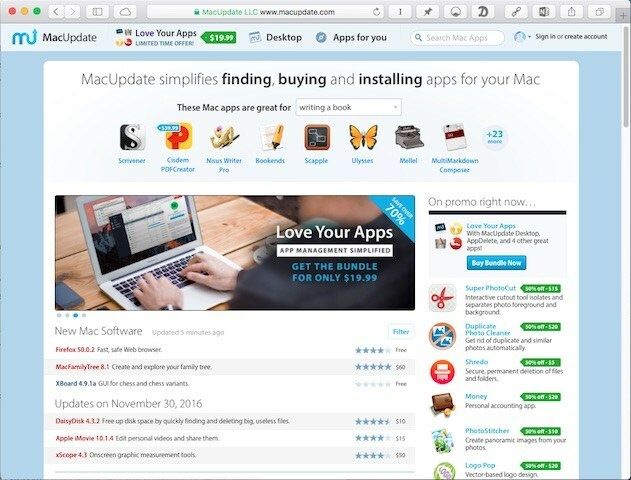 This site is an incredibly large Mac & iOS app list that you can sift through. AppShopper contains around 2 million apps to date. The website not only assists you to find new apps easily and receive notifications for price changes and different updates to items. You can look through the site by using Toggle & Search bar on the top of the site. With these tools, you can look for any app you want to find by using its icon, details, price, or last app revision date. If needed, you can change the result view by selecting “All,” “Updates,” “New,” “Price Drop,” or “Price Increase.” You can also narrow down your results by selecting a category, type of app, or if you want paid, free, or both types of apps displayed. Clicking on an app in the results list will open a single app page that has “Own,” “Wish,” and “Buy” buttons, various screenshots, a description of the app, the changelog, the app activity, and ratings by different websites along with a link to reviews on those sites. 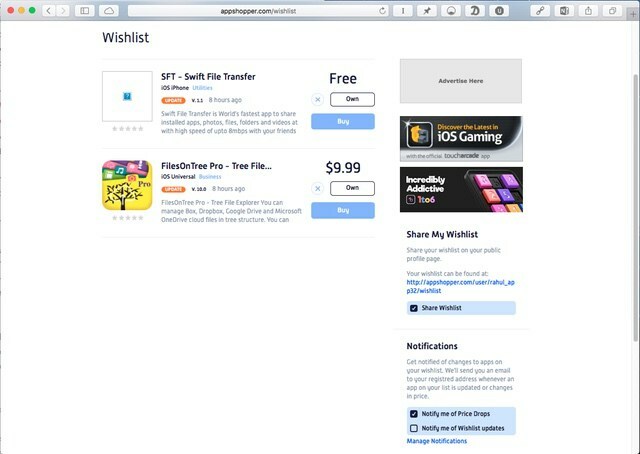 AppShopper is different from the other sites mentioned so far not only because of its search capabilities but also because you can make a wish list full of the apps that you want. When the price falls, you’ll get an email with the details on it. You can also track prices over time to see if the app has ever been on deal before or if the developers have maintained the same price consistently. Add the feeds to your RSS app in a folder named “Deals.” This will help you easily track all the app deals you want to keep up on from an easily accessible place. Create a Twitter list to group all of the websites accounts together. When you look at this list later, you can see the tweets made from all the accounts in the list. You won’t have to add the users of the accounts in your list and you won’t have it cluttering up your Twitter feed. This is also a great way to track everything from one area. The Ceceree app for Mac is another way for you to create an app wish list from the iOS & Mac app stores. Adding an app to Ceceree through a browser or search extension will let you watch the apps in your list and notify you whenever this is an update or price change. The downside here is that it costs $3.99 to use this program. But if you are constantly buying new software or tracking a lot of apps, you want to give this a shot. After reading the many ways you can find and track deals, I hope that you will see that finding deals on various PC & Mac apps is much easier than you thought it would be. Thousands of apps have sales each day, so if you follow a lot of the sites listed, you won’t need to pay full price for an app you want ever again! It will require having some patience though. Many of the sites will also provide bundles of apps with large discounts or let you name your own fee. You should check out all of the sites we have listed if you’re interested in getting some great discounts on some of the apps you want or love already. Let us know down below which websites you like the best and why! And, for any major bargain hunters out there, are there any other important tips we overlooked when we wrote this article? Tell us what we missed and let your fellow readers know some of the best tips for getting discounts.